Jersey Sport and the States of Jersey Police are teaming up this summer to get as many children and teenagers as active as possible, by offering FREE sports sessions throughout the holidays. 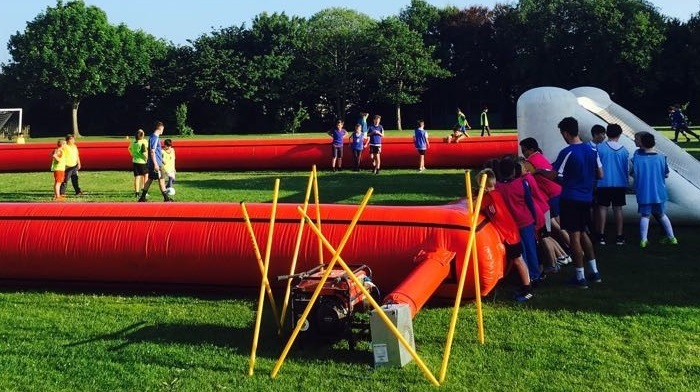 The inflatable football park will be taken out around the island, while there will also be regular opportunities to play dodgeball and short tennis amongst other sports. “By bringing sport to our local communities we feel we can make a positive impact on the lives of young people,” said Jersey Sport Community Programmes Officer Dan Garton. The fun sessions will be aimed at pupils in Year 7-11. Details of the venues and times will be released on the Jersey Sport website and social media. “Sport has huge value within the community and the opportunities provided locally are superb,” added Police Sergeant Paul Kemp from the Community Policing Team. “Being part of a team, playing sport, making friends doing something that is fun and good for your health at the same time can only be positive.